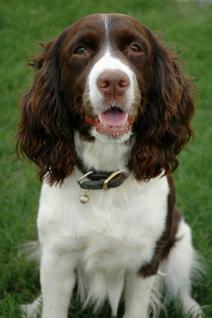 Springer Spaniels, like nearly any other purebred dog, are prone to certain genetically inherited diseases. Researchers and breeders alike are working together to identify these diseases in an effort to exclude affected dogs from breeding stock and help the Springer breed emerge stronger and healthier than ever. The following list offers a sample of diseases and disorders that affect the English Springer Spaniel, and they are listed in no particular order. Dysplasia is a degenerative joint disease that mainly affects the hip joints, although it sometimes affects the elbow joints as well. Dysplasia is diagnosed through the use of x-rays that are compared to the Orthopedic Foundation for Animals (OFA) grading system. OFA certifications are excellent, good, fair and poor. Treatment mainly consists of pain management and supplementing an affected dog with glucosamine and chondroitin to promote cartilage growth in the joints. Retinal dysplasia is an inherited eye disorder that results in a malformation of the tissues of the retina. Instead of laying in smooth layers, the tissues are folded and impair an affected dog's vision. The condition can be diagnosed in puppies as young as six weeks by viewing the retina with an ophthalmoscope. Progressive retinal atrophy is more commonly known as PRA blindness. This eye disorder involves the deterioration of retinal cells. PRA poses a special challenge to breeders because the condition often doesn't surface until after seven years of age. This means an otherwise healthy dog could be used in a breeding program before the problem ever surfaces. Current testing methods are not completely reliable for identifying dogs that may be affected at some point in the future. Bloat is a condition caused by excessive buildup of gas and fluid in a dog's stomach. For reasons not completely known, the stomach begins to twist and close off it's entrance and exit points. The condition is extremely painful and can lead to death if not treated in time. Once a dog has bloated, there a good chance he'll bloat again. It is not yet known whether this condition is hereditary. Idiopathic epilepsy is characterized by seizures that have no identifiable cause. Veterinarians diagnose the condition based on electroencephalogram readings as well as a dog's history of having repeated seizures. Common medications used to control the seizures include phenobarbital, Valium and potassium bromide, among others. Ventricular septal defect is a congenital heart defect caused by incomplete formation of the wall between the left and right ventricles of a dog's heart. The result is inefficient blood flow that deprives the body of oxygenated blood. The severity of this defect ranges from one dog to the next, and it can cause anything from a mild murmur to ultimate heart failure if the defect is large enough. Mild cases of ventricular septal defect typically do not require treatment, but more severe cases call for a surgical repair. This is a genetic blood disorder that is caused by a deficiency of the gene that regulates the enzymes that convert sugar into energy. Some Springers are simply carriers, while others show symptoms of the disease. Symptoms include fever, lack of appetite and pale gums, and the dog's urine will look distinctly darker at times. There is no treatment for the disease at this time. Fucosidosis is an inherited, fatal disease caused by a lack of the enzyme alpha-fucosidase, which is responsible for breaking down complex compounds into molecules that can either be reused or removed from the dog's system. In the enzyme's absence, complex compounds build up in the brain and cause loss of motor control and balance, as well hearing and vision loss among other symptoms. This condition is diagnosed through DNA blood testing, and dogs are given a status of either clear, carrier or affected. This testing enables breeders to exclude carriers and affected Springers from their breeding programs. Rage syndrome has been associated most closely with Springer Spaniels, although this is not the only breed to exhibit this syndrome. An affected dog will suddenly attack the closest person or animal, seemingly without provocation. The exact cause of this behavior is not yet known. Theories include the possibility that it's related to seizure activity, an imbalance in brain chemistry, or that it's possibly a form of dominance aggression behavior. Further study is needed to determine the cause and an appropriate treatment. If you own a Springer that exhibits signs of any of these diseases or disorders, contact your vet to discuss the situation and decide if testing is called for. If your dog is diagnosed with one of these conditions, let your breeder know. Many breeders are actively working to identify hereditary diseases in their bloodlines so they can remove affected dogs from their breeding programs. The ultimate goal is to produce healthy English Springer Spaniels that will become great family companions. Any information you can contribute may help the breed as a whole.